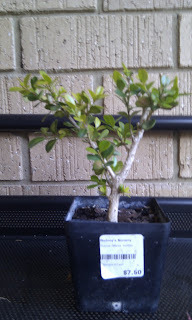 I decided to put this Buxus up on the Ausbonsai forums in the hope of getting some expert advice. I agree that this will give much more taper and some nice trunk movement, however, I am still unsure of where I should take it from here. The first shoot on the right appears to be a little low for a first branch and the ones on the left would be on the inside of a bend in the trunk. Perhaps I will have to cut it back hard and hope for some new shoots. You might need to enlarge the photo to see it clearly but the tree has a horrible wound on the top which will not heal nicely for a very long time, the tree also has no taper whatsoever. My plan with this one is to put it into a bigger pot and grow it on for a bit. This will thicken the trunk and then I may try for a broom style. Any advice on this plan? As you can see I have let it go a little wild. It has had a hard time since that first picture. First it was infected by aphids and just as it was recovering from that my 8 week old Ragdoll Kittens had a few bites of it. 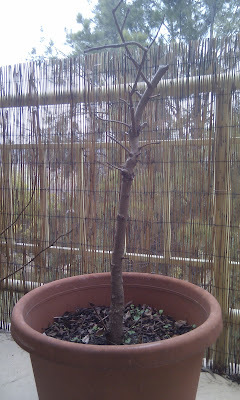 Anyway my plan is to let it grow freely to put a little bit of size on the trunk and get healthy again. Then come midsummer I will go about drastically shortening it. From what I have read you can take these things back to a bare trunk and they will recover fine. 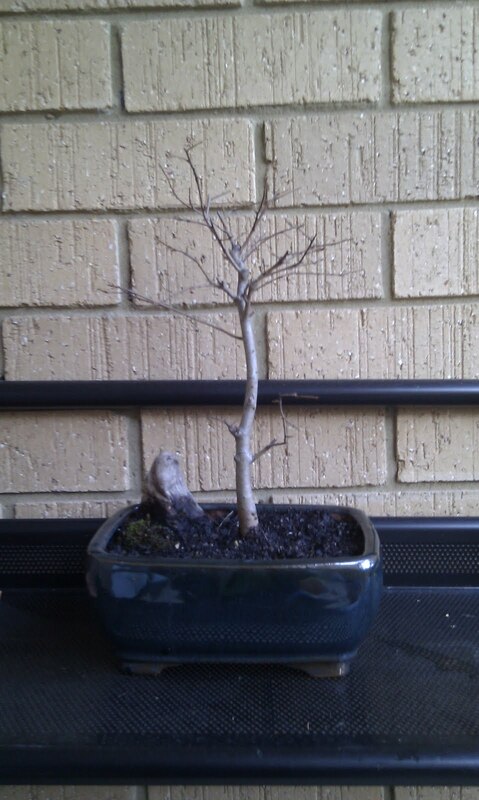 During the summer of 2010 my fiance and I dug up these two little self seeded Japanese Maples from my fathers back garden, just for a little bit of fun. Still not good I know. 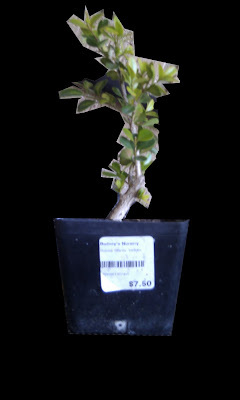 I have a plan to drastically shorten the height of the tree. 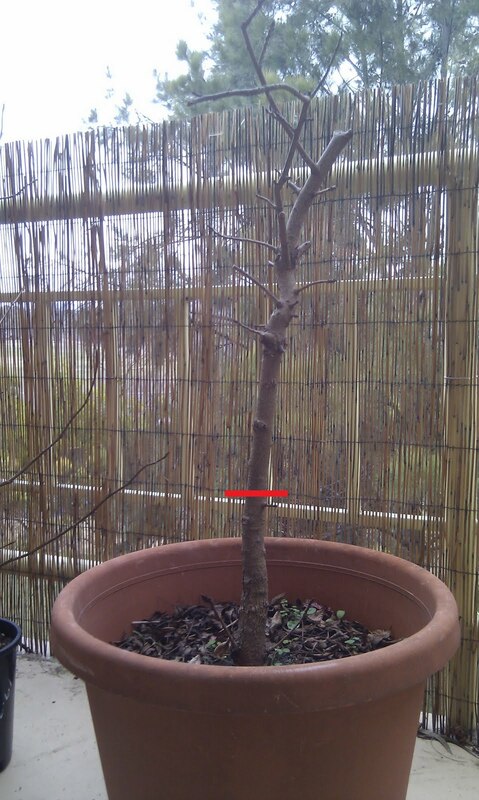 I'm going to cut it back down to the red line shown below. It's getting closer to spring time here in Australia. 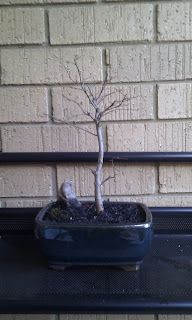 I decided that a re-pot into a nice oversize pot would do it some good and help fatten it up a bit. Without its leaves the flaws in its structure become even more evident. I will have to work on this over the coming year.